Perhaps you’d also like to rise to some of these challenges to up the ante in your gameplay! And here is a wonderfully-interesting thread where players share various experiences and discoveries. Map | My attempt to maximize the places you go in Lower Kharé. This is the one you start Sorcery! 1 with. … Heavens, I forgot where I picked this up from. I am so sorry; I will try to figure this out. If anyone knows, I’d be grateful to hear you out! There are a few ways to get this item. If you don’t have one when you meet him, you can win it from the Red-Eyes man sitting (with his eyes closed) outside of an orphanage. Aliana (from Sorcery! 1) can give you these. Bought in Cantopani in Sorcery! 1. There are a few ways to obtain this item in Sorcery! 2. The earliest you may get it might be when you visit this tent (the one with the winking elven woman who assures you that the tent’s attraction, a male entertainer, is very funny) at the Festival of Thieves. You can have the tent’s occupant willingly cast aside the wig (so you can retrieve it) by casting SAP on him to make him depressed. Found in Mantis-man’s house of bones. The easiest way to defeat Mantis-man might be to control his mind with the spell LAW – and instruct him to cut off his own head. Asking the Flayer about the box seems to always result in a fight. The most peaceful way to get all of the box’s contents is casting dIm (d-i-m) on the Flayer. Purchased from a flame master(?) at the Artist’s Quarter. These well-done sketches can be gotten from the arm-less artist at the Artist’s Quarter. You can find these berries near the ruins. The Svinn chief from Sorcery! 1 gives you this key in gratitude after you rescue his daughter. Given to you by the blind beggar in Sorcery! 1 after you give him a gold coin. It is a key to let you out of the Red-Eyes jail should you be captured. Noble Moulas is a living corpse that can be found along the street [row of houses] parallel to the Festival of Thieves. (You’ll find a person laying facedown in the alley. One of the fastest ways to defeating him if he attacks you is casting SIX to fight each of his body parts with a clone of yourself! There won’t even be an actual fight if you do this, by the way.) Look in his throat for a torn piece of paper. This is part of poor Moulas’s spell-line. When you are traveling in the Fallen Quarter (while looking for Theetah,) do sit when you get the option to do so. You’ll sit down on a rock and notice something sticking out from underneath it; this is the other half of the torn piece of paper. Moulas, sensing his impending demise, wrote down his spell-line and hid half of the parchment here in the hopes that someone would find it. 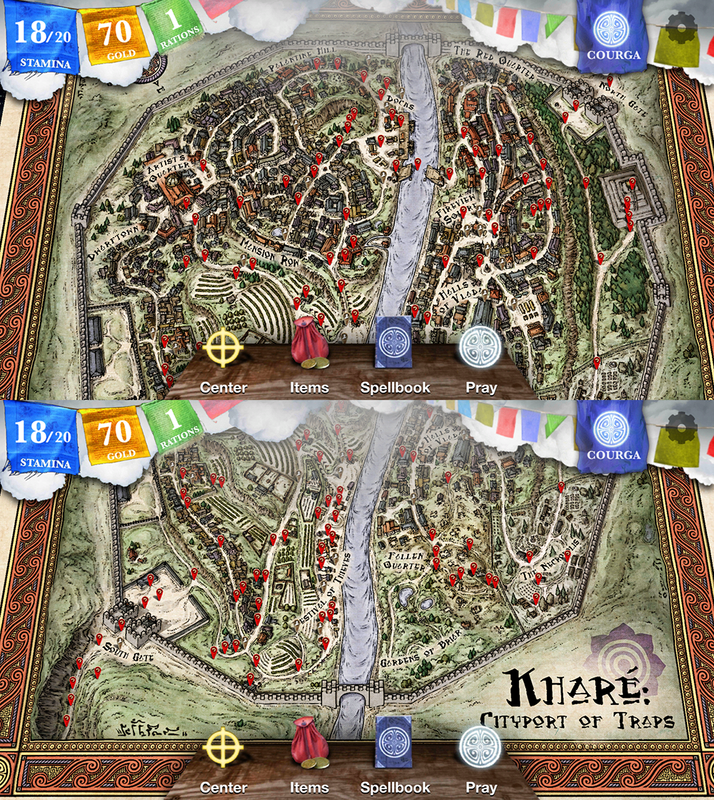 Play Swindlestones with the citizens of Kharé and outwit everyone at the Gambling Halls of Vlada! Feel those bulging pockets. And then buy the legendary sword from the blacksmith for 40 gold pieces. Theetah, the Seventh Noble, didn’t want to regain his badge again; I held onto it as a memento. A grateful Theetah gives you this. This is a very cool artifact in Sorcery! 3. You learn this clue in Sorcery! 1 if you return Glandragor’s axe (purchased in Cantopani) to him. You can pick this clue up from Flanker. 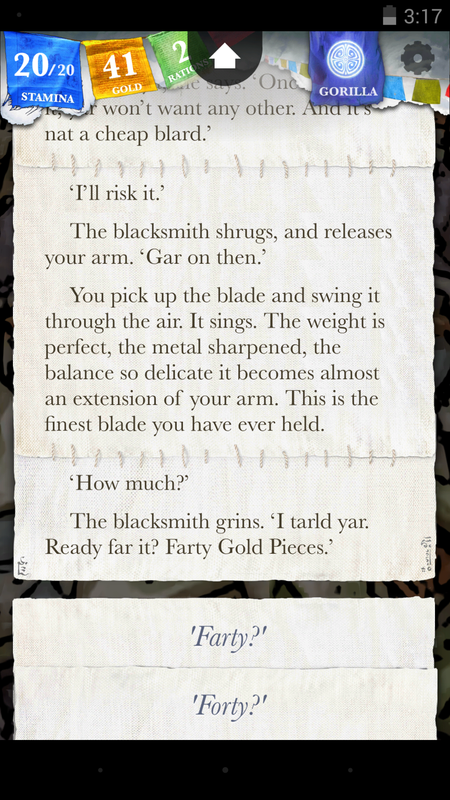 One place to pick up this phrase is to ask the blacksmith about werewolf armor or ask wary locals about Vik. Event | **You can meet the Goblin King who lurks underground and throw a big wrench in his plans to overrun the city of Kharé. To make the goblins rebel against him, pretend to be unconscious in front of the Goblin King. Glitch | Get swole. A glitched item in Dwarftown makes for infinitely-increasing offensive strength. You can go shopping at the store in Dwarftown and drink the mystery potion (which turns out to be a strength potion!) an unlimited number of times to become super strong in battle. This is a glitch; I wonder if it’s been patched yet. Please let me know if this still works, or if it is patched! Glitch | ****Gold exploit: taking advantage of the goblin’s bathhouse eavesdropping mission. No Face, from Spirited Away, knows how to make it rain in the bathhouse. This is an additional way to leave the city with a bulging purse… It exploits a glitch. A surreptitious goblin emerges from his home to offer you four gold coins to spy on his “friend’s” secret meeting down the street in a bathhouse (the four gold is for the bathhouse entry fee.) This goblin retreats into his house after promising you more coins when you return with the info when you’re done visiting the bathhouse. Put off entering the bathhouse and bombard the goblin with visits. The gamer who found this bug posted about it in the midst of surpassing gains of 400+ coins from the goblin (and says you can keep makin’ it rain.) Note to players: I haven’t tried to exploit this bug, so I’m unsure if you miss meeting Flanker the assassin at The Wayfarer’s Inn (after he invites you to meet him there when you two talk at The Festival of Thieves) if you spend a lot of gametime (time passes a little per action) shaking the goblin down. Would anyone remember this goblin’s name? I’d be very grateful for your help in making it possible to add his name to this guide. If you don’t meet him immediately, nay frets. After you perform some actions, you’ll notice him show up! Meet up with Flanker at The Wayfarer’s Inn after he invites you to join him there. After you win at Swindlestones against him, he’ll offer to take you to The Council of the city. How to keep Flanker in your debt: at The Wayfarer’s Inn, don’t lose to Flanker in Swindlestones and don’t step into the Portal Trap in The Council’s room while he’s in the room with you. Visit this isolated tent at The Thieves Festival and goad the little creature into picking a quality prize out for you. Event | Cast JIG to help the musicians out at The Thieves Festival! And therefore get invited to hang out with them and share a tasty meal (you need to eat once per day) at the dubious Meat & Cleaver later that night, and pick up clues about Vik and the Red-Eyes. The merit of going to jail would be that you can befriend your jailmate, a black elf. As an aside, I think it is possible to get a green-haired wig (if you do not own one already) from Lorag’s little experiment. Item | ***Acquire a (very useful) gold mirror. The gentlest and cheapest way to acquire a gold-backed mirror would be to look under the table at the Flayer’s kitchen, cast the dIm (d-i-m) spell on the Flayer chef and, while he bumbles harmlessly about, you can eat his food for free (“the Flayer watches you briefly while you eat and suggests adding some salt”) and take all the contents of his box. 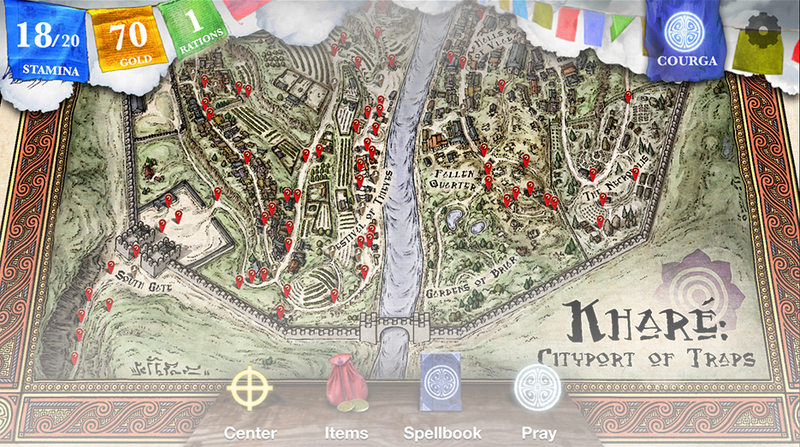 The scroll (written in a language you cannot read) will benefit you greatly in Sorcery! 3.] He’ll attack you if you show interest in the box otherwise – and his several arms make him a formidable opponent. In the front yard of the house, there’s a healing fountain and a giant bat lurking in the tree. Use DOP to enter the mansion, and step through the cool fire to enter the secret room. You need to use a thin, long object to open the door. If you don’t have a bamboo flute or something else that may work, there should be a cane in the upstairs bedroom. If you take it with you, you can return it to the owner of this mansion, Lord Theetah, later. Search the bandages for the Seventh Noble’s badge. Look around the haunting room for clues as to what happened to the estate’s owner. Strategy | How to defeat the strong wraith in Lord Shinva’s mausoleum without fighting. The wraith is a powerful opponent with many advantages (and your silver weapons are not very strong.) The fight can be won, but may be difficult. Do not go down the stairs in the tomb without casting SUN with your sun jewel. Event | Save a young woman (outside Lord Shinva’s mansion) from the plague. When you are close to Lord Shinva’s mansion, you’ll see a pained-looking creature (with a bell around its neck) shuffling towards you. When the creature is very close to you, cast dOC on a Blimberry juice potion and throw the liquid onto it. The creature’s boils fade away, revealing the healthy skin of a young woman! Some conversation options reveal that she is from the city (Birritanti, I believe it was) near the plague village from the first game. If you’re playing with a save file that includes your actions from the first game, you can pass on advice to her, such as where her ill family may be (at the plague village.) Or tell her to discard her disease-ridden cloak. It was very uplifting to see how much better she felt after being healed! Clue | Learn the answer to the impossible question of the priest of Slangg – by exploring southwest Kharé. Go to this location to sit and eat with the poachers when they invite you over. Talk/interact with them long enough so that you are there when a woman named Sirisi comes over. Stay to meet her. This is the answer to the impossible question – which is the question that has never been asked. At the foot of the ziggurat, I think you regain stamina if you insert a gold coin into the gargoyle’s mouth slot and gaze into its eyes. None of the following spells get added to your spellbook because the stars atop of the ziggurat aren’t accessible elsewhere, but they sure are useful/interesting! Item | In the Artist’s Quarter, you can pick up clues regarding the Nobles and some items that may help in future games. The arm-less artist may be mischievous, but you can acquire lifelike sketches of some of the Nobles (for free or you can donate a coin to him) to add to your clues. Event | You can listen to the entire assassination scheme and have a lovely time at the bathhouse. Clues | You can learn about Vik’s character and plans early on by sleeping out in the rough. One way of learning about Vik’s shocking plan of creating a werewolf army (human enough to understand directions; animalistic enough to subjugate and control) is to sleep outside here. A female werewolf will prowl around you. After you fight her, you can pry off her werewolf-shaped armor (which kept her in werewolf form despite the phases of the moon) and see a tattoo of ownership on her neck (which reads “Vik.”) A few clues can be gained from this night. Choice | Should you leave your Spirit Animal behind, and enter into worship of the deity Courga, the god of grace? Having the gentle Courga along was comforting; he provides his knowledge where he can. Unsolved | How does one get to the Gardens of Briar? I am still figuring this one out. This is one place where many players would like to go but haven’t yet worked out how to get there. Would anyone know how to make it to the Gardens? Does one have to step into a certain Portal Trap or climb down into the sewers in a particular place? Glandragor’s wife presumably can be found in Kharé! She may be the woman who tells you that her husband has been missing for ten years. If you see a plank laid across from window-to-window while wandering the city of Kharé, you can cast BIG and then pluck it from its place to thwart a thief clinging to it. Not sure if you find out more about this little event or earn anything for it. In Dwarftown, you see many dwarves (and notice they’re grumpy to creatures taller than them [including you, a human.]) One of the actions you can do is “walk on your knees next to them.” They are not impressed and you feel like a terrible person. To throw the fight (between the pixie and the sprite) at Dwarftown… you need to get there in time. A little time passes every time you walk somewhere and every time you make a choice. Many players (after having a rewarding time in Lower Kharé) arrive in Dwarftown too late to do anything. My conclusion that Lorag had been killed was because of the telltale aftermath in his home – and how angry his beloved companion, a pet Bristle Beast, was. It seemed the animal was stuffed into a cupboard, as it does not attack you when you sneak into the late Lorag’s empty home. It wouldn’t seem that Lorag, being fond of his pet, would have pushed him into a cupboard and then abandoned him (or perhaps Lorag was hiding the Bristle Beast from intruders.) Lorag’s attackers themselves were likely responsible for shutting the animal in there, as the loyal pet would have protected Lorag if given the chance. Casting SAP on the beast causes it to whimper in sadness (presumably about its owner’s demise) and retreat for good. Would anyone know what happens when you successfully play the little boy’s rock/stone apple game at the Thieves Festival? If you haven’t fought with your weapon a certain number of times before playing this game with the boy and his sister, you’ll have fun with them but not make any of the hits you’re aiming for (this is what happened for me.) I’d love to hear how it went otherwise for you!